Daryl Bornstein an independent Audio Producer, Sound Designer, and Sound Engineer for Televised Special Events, Recordings, and Live Performances. Clients have included The Metropolitan Opera, New York Philharmonic, The Boston Symphony and Boston Pops, Jazz at Lincoln Center, the Mostly Mozart Festival, Great Performances on PBS, and Live From Lincoln Center. 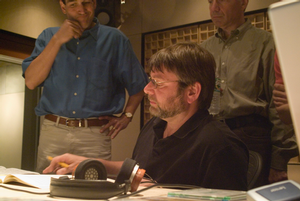 While specializing in Classical Music, Jazz, and Theatre, he has worked on projects ranging from the first NFL HD broadcast to the infamous and ill fated Michael Jackson TV Special and the Rolling Stones “Shine A Light” film both shot at New York’s legendary Beacon Theatre; from the Opening Ceremonies of the Nagano Olympics to the 911 Memorial Service at Yankee Stadium. And just because everyone needs to do it once, he spent four days babysitting MTV VJs in a delay tower twenty feet above the unwashed multitude at Woodstock ‘94. Daryl earned a BA in Music from Dartmouth College, survived four years as Road Manager for Lou Reed, and was fortunate to have served as Personal Assistant to Leonard Bernstein.